Because we have a brand-spanking-new video to show you! We’re pretty excited to share our story with the masses, so send this to friends, family, colleagues, and talent scouts all over the world! This e-newsletter is so full of good stuff we want to keep the intro short. So there you go, no fluff, no filler, no funny links to click and get a chuckle at work. Oh, except for this one. p.s. If you didn’t see us on Sky News last Saturday, here’s the link! FREE (that’s right FREE) access to the workshop ALL THE TIME! 10% off ALL stock, parts, and courses! A pack of Broken Spoke postcards! A really pretty supporter card for your wallet! Invitations to workshop improvement parties! You can sign up online or in the workshop. Yay! 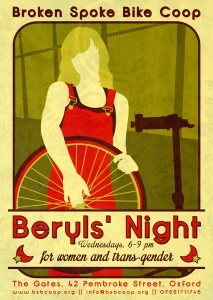 Team Beryl had a little holiday from running our Wednesday women & trans workshops, but we haven’t just been cooling our boots. 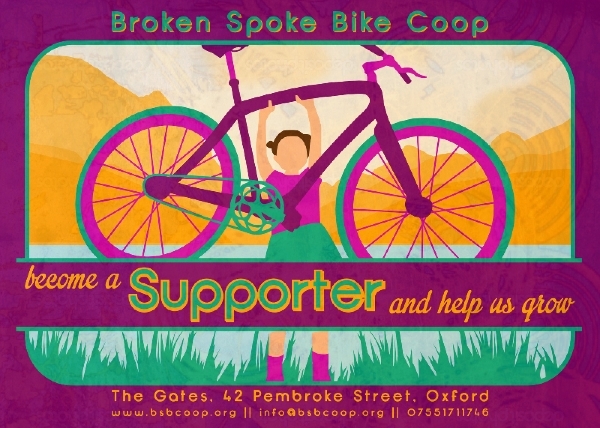 We’ve been evaluating, plotting and planning what we can do to make the Broken Spoke workshop and all our activities inclusive. 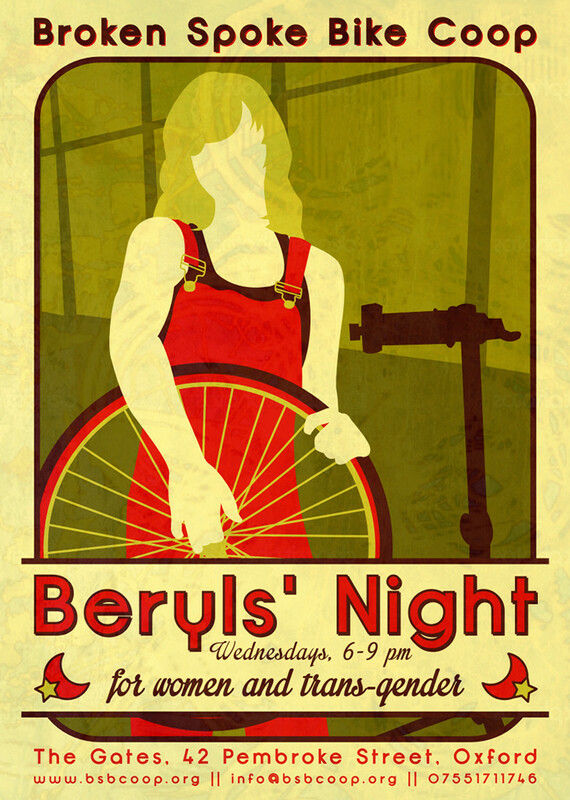 The product of this plotting is that we’ll no longer be running our twice monthly women & trans night, but instead we will be going out into the community to run free taster sessions in bike maintenance to encourage more women into the workshop. We’ll be at Oxford Pride on 7 June, come say hi! 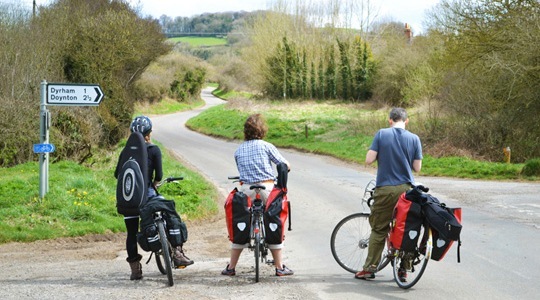 This spring, Pedal Folk are performing across the South and South West during a recreation of the 1913 London to Somerset cycle trip made by poet and wordsmith Edward Thomas in his book ‘In Pursuit Of Spring’. This ‘Pedal Folk’ cycling music tour will see them tell the story of Edward’s trip, whilst performing at places he passed through or nearby on his journey. The performances will be a mixture of songs written by them using his words and imagery, readings from his book, songs and tunes mentioned in his works and/or collected in areas he passed through and our narration. This is a one day Conference that will showcase the work of communities who have come together co-operatively to make a difference to where they live. You’ve got TWO chances to hear about the Broken Spoke, because Cassiope will be speaking both before and after lunch. Pan-european, intimate and inspiring, Tandem is a brand new festival starting this year at Hill End, Oxford. From the 20th to 22nd June, Tandem Festival will showcase a range of musicians and performers, alongside workshops, documentaries and talks promoting community projects and eco-living. The Human Search Engine is a unique and interactive experience, designed to challenge your preconceptions about mental health, stereotypes, and stigma. Give your questions about mental health to our Search Engineers, or pick a question like ‘what is mental health?’ from our Question Bank. Just like an internet search engine, our Search Engineers will then match your question with one of our Voices of Experience to give you an answer through a one-to-one conversation.